The answer, of course, is “no.” My job is to design newspaper pages and develop web projects. But next time I can give a different answer. 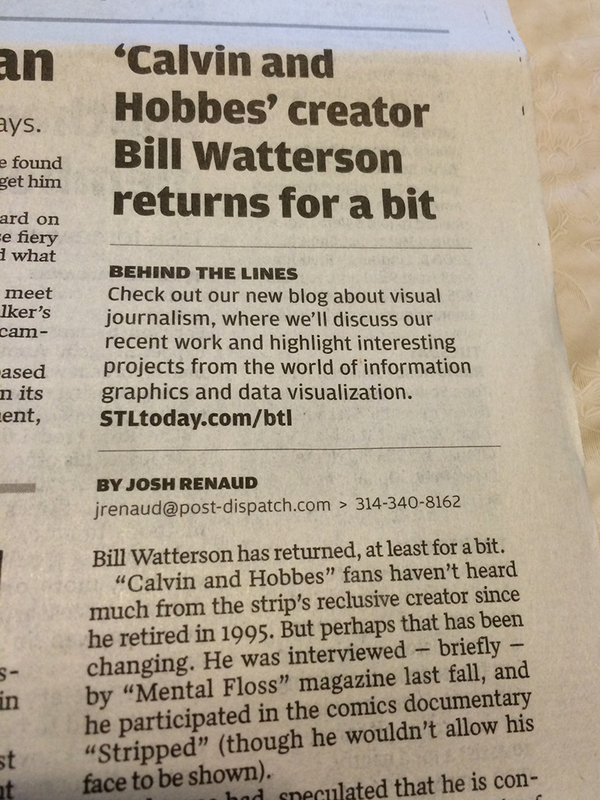 This week I had not one but two hard-hitting, investigative stories published in the Post-Dispatch. So, what topic did I scrutinize with journalistic fervor? On Monday, one of my favorite comics, “Pearls Before Swine,” began a new storyline in which a second-grade girl interviews cartoonist Stephan Pastis, but is underwhelmed by him. On Wednesday she takes his pen and draws her own panel in each of the following day’s strips. The joke was that the girl’s art was far better than anything Pastis could do. I was immediately struck by these “second-grader” panels. I am a huge Calvin and Hobbes fan, and these panels cried out “Bill Watterson to me.” I searched online to see if anyone else thought the same thing. I found plenty of speculation on blogs, but no definitive answers. Pastis himself played coy, teasing readers with tweets throughout the week. Tuesday and Wednesday are my off days, so I emailed my editors from home, pointing out the strips and suggesting that somebody write a story. When nobody did anything, and no other newspapers published any story on the topic, I asked again on Thursday. It seemed to me this was a story newspapers should be all over. It was our own medium! Anyway, I was told “If you think it’s a big deal, you should do it.” So I did. A photo of my story in the Saturday Post-Dispatch. Early Friday afternoon I posted a blog on STLtoday.com about the speculation. The editors liked it enough that they decided at the news meeting to include the story in the Saturday morning newspaper. I was stoked. Late Friday night, though, Pastis confirmed on his blog that the speculation had been correct: Watterson indeed had drawn the panels. 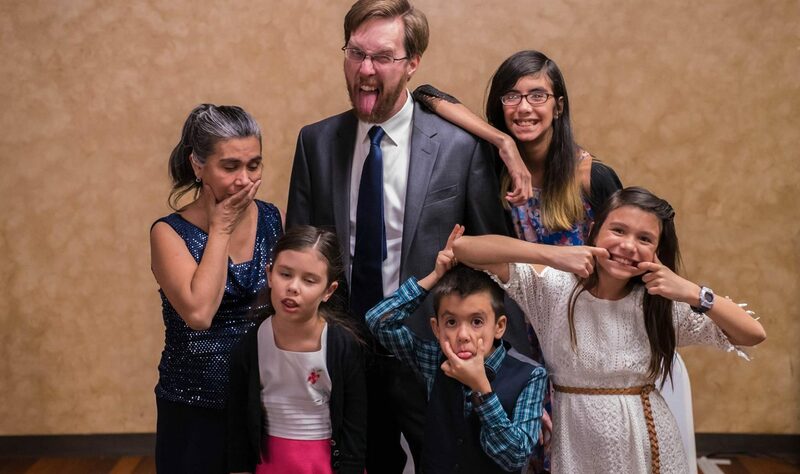 This was soon followed by a Washington Post exclusive interview with the famously-reclusive Watterson. Ron Wade, the night news editor, did a quick rewrite of my initial story to incorporate these developments. Saturday morning I saw that plenty of outlets were regurgitating Pastis’ blog post and the Washington Post’s article, but nobody had reaction from other cartoonists. 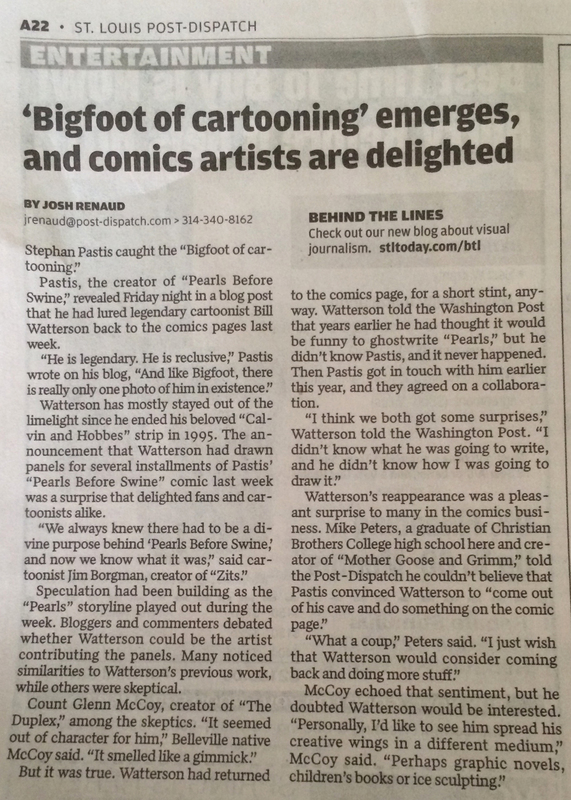 So I reached out to a bunch of cartoonists who had connections to St. Louis and wrote a follow-up blog for STLtoday. Ron Wade decided to publish that followup in the Sunday paper, giving me Josh Renaud bylines in print two days in a row! Cardinals beat writer Derrick Goold told me “Man, you mean we have a cartoons beat?” I felt lucky to cover the “beat” for those couple of days, because I have a feeling I’d have to compete with Goold if we really had such a thing. A photo of my story in the Sunday Post-Dispatch.